BRCSI is a bold and innovative thrust to help preserve the global environment and our rural Blue Ridge vistas. By participation, concerned citizens are cooperating with landowners for the good of the community. 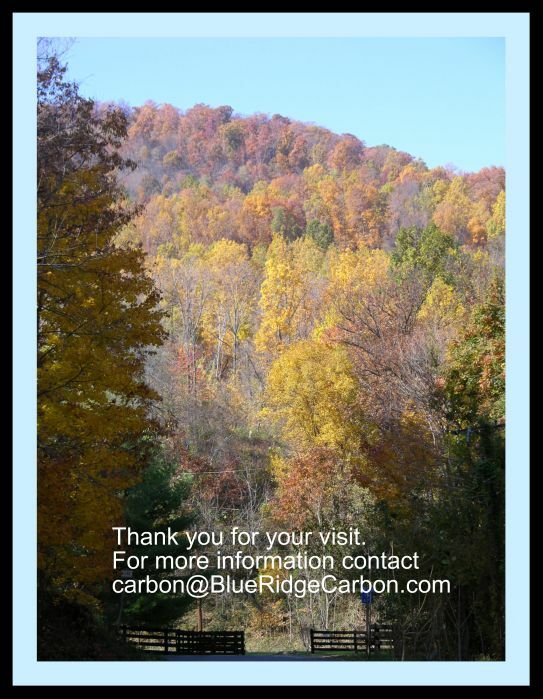 What makes this possible is the tremendous ability of the Blue Ridge forests to sequester carbon dioxide (CO2) gas in the atmosphere. Many experts agree that the earth’s temperature is gradually warming. A larger concentration of CO2 in the atmosphere is a likely contributor. There has always been CO2 in the atmosphere, due to volcanic activity, plant decay etc. At certain times in the geological time scale the levels were well above present levels. Today were are concerned about CO2 in the atmosphere that is the product of civilization: combustion of coal and oil, which is due to production, transportation, land clearing, and recreation, all of which are increasing on a global scale. While many urge reduction in these activities to lower CO2 introduction to the atmosphere, the only known way to remove CO2 is the sequestration of CO2 by plant life. In their growth, plant life converts CO2. to Carbon and Oxygen. CO2 acts as a fertilizer for plants and higher levels will stimulate more plant growth. The carbon is fixed in the plant and the oxygen is released to the atmosphere. Studies show that the approximately 750 million acres of US forest land sequester about 10% of all CO2 released in the US in the atmosphere annually. Of all the plant life and forest timber, the dense foliage of Blue Ridge Mountain trees are estimated to sequester 5 to 15 tons of CO2 per acre per year, during the active growth phase of tree life. Each person in the US share of the total US is about 20 tons of CO2 release annually. The natural life of a tree in the Blue Ridge Forest is about 50 to 100 years. During the active growth years the tree has its maximum carbon sequestration potential. This active phase starts at about 10 years and can continue to about 30 years of age. Thus for best sequestration a forest cutting at about 40 years ( trees two to three ft in diameter ) is recommended. Forest management is key to optimum sequestration, and to maintaining the health of the forest. Thus a managed forest can achieve the peak sequestration rates. Other factors that promote growth of trees and enhance sequestration, are those such as growth on south and east facing slopes, growth above 1000 ft elevation above sea level, and good soil conditions. These conditions exist in the Blue Ridge Mountains. Naturally, concerned citizens, institutions and corporations want to reduce the CO2 emissions they create. Organizations that are direct emitters (e.g., power plants) can reduce their emissions by better and more efficient practices, installing CO2 cleaners, and/or newer machines. Individuals can reduce their CO2 emissions in direct ways by reducing their use of energy intensive goods and services. When conservation options have been exhausted there is another path. As part of the Kyoto Treaty of 1997 a program of carbon offsets was devised. This allows one party who can show they are sequestering carbon dioxide to exchange the right to emit an offsetting amount with a producer (a carbon credit). While the United States had not ratified this treaty, a majority of nations have done so. In Europe an active carbon credit exchange exists with a value of $30.00 to $40.00 per metric ton of CO2 . These are so called regulated credits. These prices are for large transactions between major emitters and certified sequesters. In contrast, in the United States there is little notice of this exchange potential and standards are loose and sequesters’ bona fides are not rigorously checked. The value of the same amount of sequestered CO2 is only about 10% of that in Europe. In the US the exchange is primarily among major institutions. These are known as voluntary credits. Recently, however, the general public is being involved in retail Carbon credit purchase that amount to one or more metric tons of CO2 . Prices range from 5 to nearly 100 dollars per ton of CO2 . Because of the smaller size of the transaction and the paperwork of setting up the sale the costs are higher that those quoted above for wholesale larger credit amounts. In addition, the provenance of these purchased credit is more questionable. “Additionality” a fancy way of saying it wouldn’t happen otherwise. Regulated carbon credits must pass the test of “additionality”. This means that the carbon would not be removed unless the project is commenced and completed. In the case of forest sequestration, a periodic cutting of the mature trees is the action that greatly enhances the sequestration, and makes the sequestration an additional removal of carbon dioxide. Those interested in rural preservation can take up a common cause with the environmentalists, since much of the area most desirable is heavily forested mountain tracts. These are the same trees that provide the most efficient sequestration as discussed above. Currently any net proceeds a sequester received would be subject to Federal, State and Local taxes. 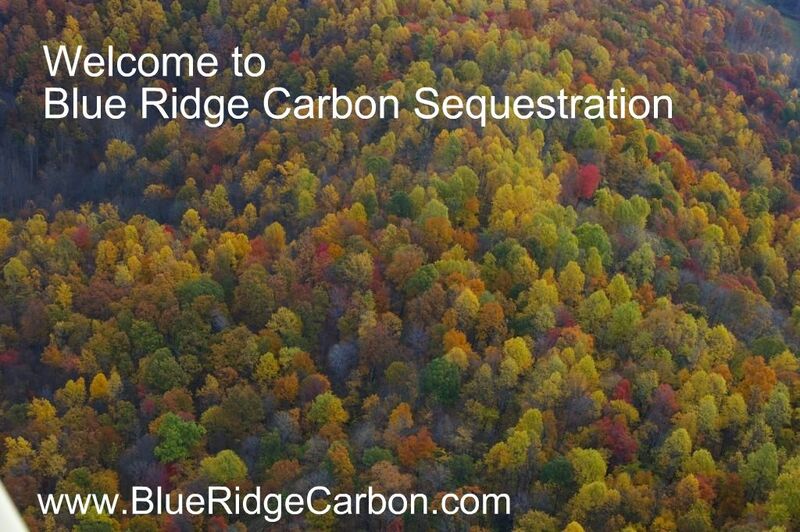 The Blue Ridge Carbon Sequestration Initiative is requesting a tax holiday be established, until this mechanism is well established.